Educators, parents, students, and supporters of the Los Angeles teachers strike wave and cheer in Grand Park on January 22, 2019 in downtown Los Angeles, California. Teachers in Denver, Colorado plan to go on strike starting on Monday, after failing to negotiate a new contract with Denver Public Schools over the weekend. 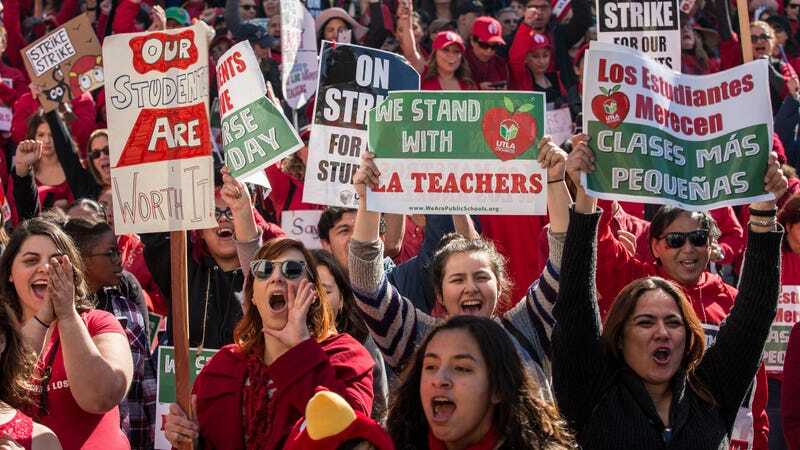 The strike follows on the heels of teachers’ strikes in Los Angeles, Oklahoma, Arizona, and West Virginia. Teachers have argued that low and stagnant salaries, increasingly expensive benefits, and overall neglect have made it difficult, if not nearly impossible for them to do their jobs, a sentiment bolstered by high rates of turnover in recent years. The strike is the first in Denver in 25 years.